First off, I enjoyed everything about this book — its poetic prose, its vibrant art, its aura of a down-home African American culture gone by. The book captured it all so perfectly. 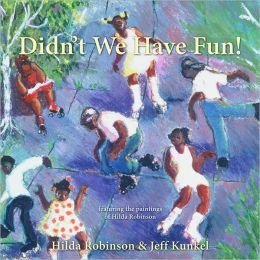 Didn’t We Have Fun is written and illustrated by celebrated artist Hilda Robinson, who shared the joys growing up in a closely-knit African American family and neighborhood. In a quiet, plain-spoken voice, she affectionately described the games she played as a child, the songs she sang, the chores completed. It’s a nostalgic look at a simpler life before television and video games were invented. The book is divided into two-page chapters. Within each chapter, we get a glimpse into different aspects of the author’s life growing up. Readers are introduced to Robinson’s five brothers and sisters, described as kind, bookish, dark skinned, strong, cute, happy and spoiled. We meet her Mama who cooked and cleaned for the family. We meet her Daddy, who often answered the children’s questions by saying, “Go ask your mother.” They made their home in Philly, but the love is universal. This book struck me emotionally. I saw myself in it, my own childhood. I saw my mother and father, and my grandparents. I found myself wanting to share this book with them knowing they would enjoy seeing themselves in it, too. This scene played out in my own life. Growing up, our Sulzeberger Hill was known as Dead Man’s Curve. We shot down that hill on rollerskates, skateboards and bicycles. Our rope was a bed sheet that doubled as a parachute. 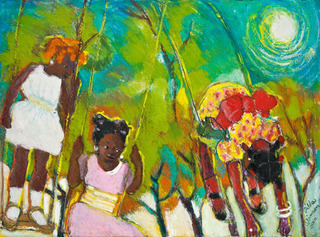 Hilda Robinson creates vibrant paintings with oil pastels laid thick and textured, colorful and bold. Her characters imbued with dignity, charm, and a spirit of pride. Didn’t We Have Fun! is published by Chickhollow Books and perfectly exemplifies what is best about indy publishing — it’s quality art for the sake of quality art, with no shortcuts due to smaller niche market. The book is co-authored by Jeff Kunkel, an artist, an ordained United Methodist pastor, and accomplished writer. 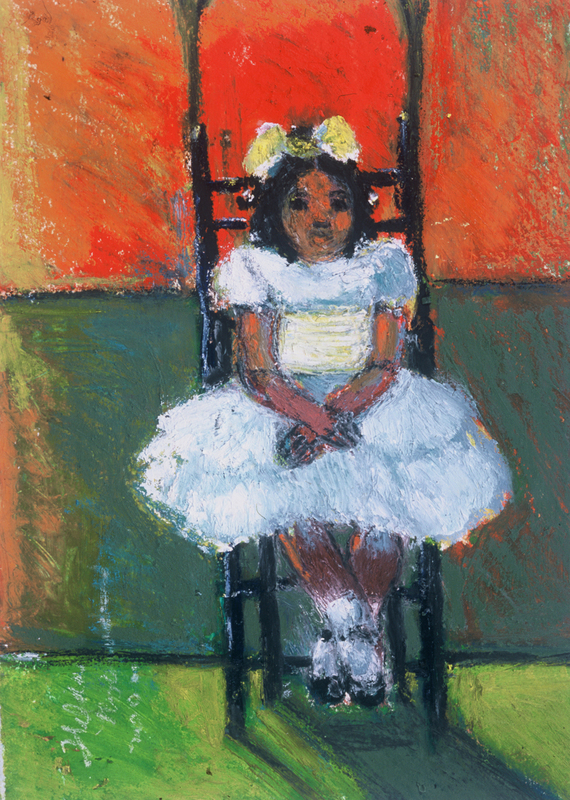 Hilda and Jeff have collaborated on several projects in public schools, churches and galleries. It’s a book to be enjoyed by young, old, and everyone in between. Don’t stow this one away on your bookshelf, instead display it in the family room for everyone to enjoy. 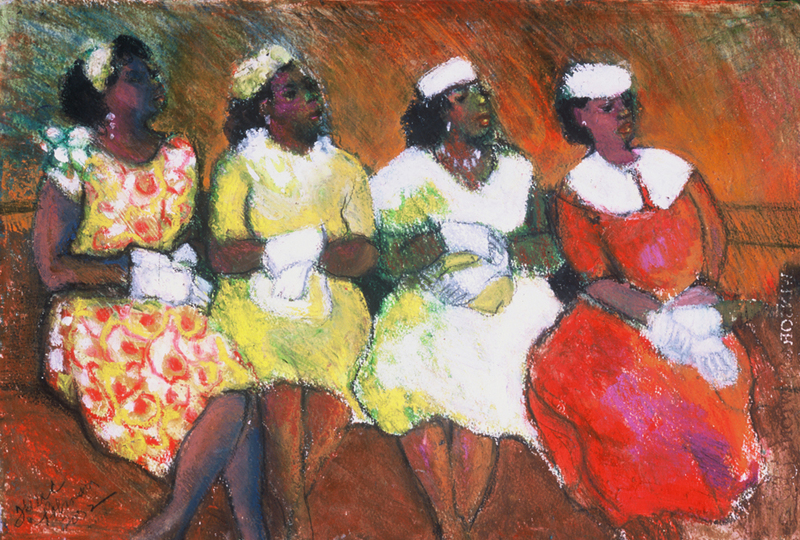 I absolutely LOVE that spread of the church ladies with their pillbox hats and white gloves. Lovely! Wow. I have to check this one out! Thanks, Don, for sharing it. Gorgeous illustrations! Have got to look out for this one. This book looks wonderful. I am going to look for it!